Maradhi Manni: Disney's 'Million Dollar Arm', English Movie Review! Disney's 'Million Dollar Arm', English Movie Review! When I started watching this movie, I didn't know anything about the subject of the movie! I watched blindly. Slowly, it caught my serious attention! The story is about 2 village boys being trained as baseball players, that too in America! J.B. aka J.B.Berstein is an American sports agent who is on the brink of losing all his money and looking for new baseball players. Once he was watching in TV, some reality shows and came across Indian cricket which is India's famous sport. He notices players bowling with good speed, though there is no connection to Baseball's throwing of the ball. Still, in a desperate move, he conducts a reality show in India called 'Million Dollar Arm' and comes across 2 Javelin throw players who won the first and second place in the competition. 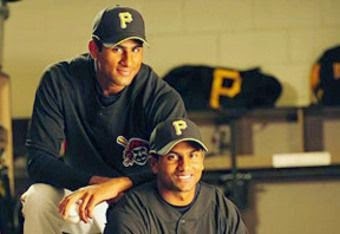 Though we, Indians are not baseball players, he takes them, Rinku Singh and Dinesh Patel to America for training as baseball players. The story moves further to show how J.B. trained them, first mechanically and finding no positive result, started treating them like family and his friend Bella, who is a Medical student helps him in touching Rahul and Dinesh emotionally. He sits with them during their pooja and yoga time, to make them feel comfortable and at home. The training had to start from scrap, i.e. even the language, English. The whole atmosphere was different for the players and with the help of Amit (Pitobash), who acted very well, J.B. gets the required results. 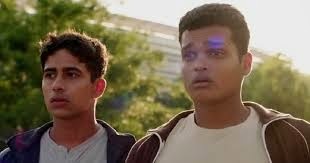 Both the boys, Suraj Sharma as Rinku Singh (the 'Life of Pi' hero') and Madhur Mittal ('Slum Dog Millionaire' actor, Older Salim) as Dinesh Patel have acted very well. The movie is like a typical Indian movie with romance (J.B. and Bella!) Comedy (a character called Amit who did quite well) etc. along with a few songs in the background! I would have liked to watch some more training programmes which would have made everybody interested in the movie. Well...you can watch this movie once at least, I assure you, you will enjoy! P.S. : Who knows? One day Abhishek Bachchan might sponsor a Baseball team! I liked the theme of the story! It can happen again! Nice review, Sandhya! Am tempted to watch this one! RAHUL BHATIA: First comment is yours, Rahulji, thank you! sm: Yes, the story is good. Thank you! I am pretty bad when it comes to films. Watch them only in 3-4 sittings when they show it on TV. This one seems interesting. Will watch for sure. As you say, one viewing. DESTINATION INFINITY: You will enjoy this movie, I am sure, D.I. UMSREFLECTIONS: Go with your daughters. All of you will enjoy! The hero looks good too! RADHA: Nothing is there to watch it again. But we can enjoy once! Sounds interesting! Will try to watch it sometime... Like DI said, baseball is quite a new subject for us, Indian, who are crazy about only Cricket. I had seen the trailers for this movie. I love the song by "The script" in this movie, especially after I heard them sing at the concert. I had not heard the other songs by ARR. Will try to catch this movie. JEEVAN: We are interested in everything western! This sport will come inside one day...soon. It is very believable. AVADA KADAVRA: Somehow I enjoyed this movie and wrote the review immediately. I liked the hero, mainly. He looks good and acted very well! A Post About 'this n that'!